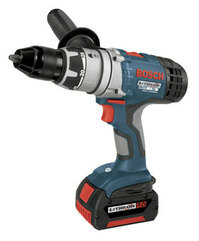 Tool Blog News Bosch adds 14.4 and 18 volt Lithium ion to lineup. We cant get enough of new tools, and Bosch is not one to let us down. They have announced that in October they will be releasing 6 new Litheon (lithium-ion) drill/drivers; 3 of 14.4 volts, and 3 of 18 volts. Did you notice anything missing? I dont see a cordless impact in the list. :( It seems very odd to me that are not going to have a cordless impact at launch. Do they just not know how invaluable they are, or maybe they just haven't had enough time to catch up with the rest of the field? I am sure a number of you are wondering why it took Bosch so long to compete with the rest of the lithium-ion boys, but at last, now we have our tools. Let us hope they do not disappoint. As always, review your Bosch tools here.